Official Picture: Mrs. Elizabeth Leiva - CEO of CGS Group and CGS2017, Mr. Bartlett - Minister of Tourism, Jamaica, Ms. Carole M. Johnson - Director, ICT of BGLC, Mr. Shaw - Minister of Finance and Public Service, Mr. Colvi Metcalfe - Chairman of BGLC, Mr. Vitus Evans -Executive Director of BGLC. CGS2017 has come to its culmination, after months of diligent work and combined efforts of its far-reaching team. Our team in Peru, in Jamaica and in Miami did a wonderful job, working side by side in unison with the ever present BGLC (Betting, Gaming and Lotteries Commission of Jamaica) our main Sponsors and fervent supporter. 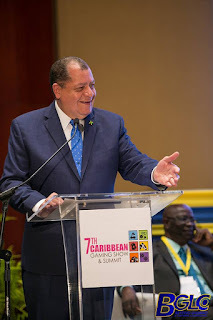 Some lessons have been learned from this journey together, and Jamaica has become the most vibrant central stage in the Caribbean on the cusp of the next level. The Government is strongly positioned to have a solid and fully regulated market, moreover, opening up legislation for the online gaming window, and opening their doors wide for new business and investments. You ought to plan ahead and consider being part of the CGS2018 center piece showcase. This is certainly not one of those opportunities that could be passed. I think for the first time in years, I shall extend a heartfelt, open and special recognition to my wonderful Team, spread over 3 key regions: Pierina, Nicholas and Natasha in Miami. Dale, Carlene, and Kristopher in Jamaica. Verónica, Ivan, Gonzalo, Claudia, Gerardo in Peru and Chris in Brazil. They all gave me a hand to make this happen. And last, but not least, to the all important BGLC Team having there banner held high by Mrs. Jeanette Lewis and Mrs. Carole M. Johnson. To our Sponsors, Exhibitors, Speakers, Media Partners, Gaming Associations and the Jamaica Tourist Board, thank you very much for your constant support and enthusiasm. To end off, if I may say further to CGS2017 in Jamaica, it was ground breaking experience! And marked having an amazing time with Friends and industry Colleagues from all four corners of the globe. We shared an absolutely splendid time frequently the paradisiacal Half Moon resort, the illustrious Montego Bay Convention Center, and suave Mosino Gaming Lounge that hosted our Welcome Cocktail extravaganza, and the new Hard Rock Café, where Bet Cris sponsored an aptly themed social event to the tune of musical harmony. Some "birds" ended the night in Margarita Ville, sharing drinks and dancing. Some chose to stay in the Villas, sharing spectacular 6 rooms and 2 story dwellings, just a stone´s throw away from the beach each unit was even endowed with a Caribbean blue pools. I am sure we will harbor some stories for many months to come after Jamica. Thus, we are all awaiting for our next meeting again with enthusiasm for the ever evolving next edition. Hope to see you all next year!